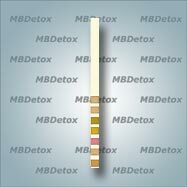 The Urine Check 7 Drug Adulteration Strip is a fast dip-and-read test designed to verify the validity urine specimens. The Urine Check 7 Drug Adulteration Strip is a fast dip-and-read test designed to verify the validity urine specimens. Adulteration is the intentional manipulation of a urine sample and the Urine Check dip strip measures 7 different criteria to determine whether or not a sample has been intentionally altered to defeat drug testing. The seven-in-one test strips are based on chemical reactions that display distinct, easy to read colors in the event of urine tampering. Just dip and compare the colors to the provided chart to see if a urine sample has been tampered with. Drug testing administrators can use this before accepting a sample as valid. Drug testing applicants can test their own sample to make sure that they do not submit dilute samples and to ensure that nutritional supplements do not create excessive creatine, nitrate, or pH levels.